Wifestyles Blog & Photography: Rolling In The Deep. Let's talk Grammys shall we? Did Adele kill it or what?! I'm almost positive her ex wishes he wasn't an "ex"anymore. As far as Jennifer Hudson goes, that tribute to Whitney was beautiful. Then we have Nicki... how is she FAMOUS again? Her performance literally freaked me out. It was beyond terrible. The cherry on top to Grammys ending was seeing this wonderful tweet from Barbra. AKA- Jenelle's oh so wonderful mother from Teen Mom 2! PS- Kate Beckinsale and Carrie Underwood were the best dressed for sure! Stunning! i'm so sad i missed it! I was so sad that I missed it! I am definitely planning on finding those Adele and Jennifer Hudson videos. Such powerful voices! I can't miss out! Bahahahahaha I didn't watch it but I am laughing at that tweet. LOL. We don't have cable so I didn't watch it, but I do know that Adele is amazing!! The choir I'm in at school is singing "Someone Like You" for our Pops'concert...we're just having a hard time finding someone who can sing the solo that low! :) It's a great song though! :) Glad you shared this w/ us...<3 Love your blog!! 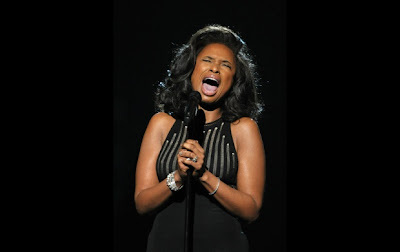 Grammy's were AMAZING-- Jennifer Hudson has always been a favorite of mine and she definitely did Whitney justice. So beautiful! I was LOLing at that tweet, too. Started following her and realized it is not actually her.... talk about disappointment :( , but whoever it is makes me CRACK up! Adele and Jennifer were phenomenal! I totally agree with you on all accounts!! Jennifer's song was phenomenal...so simple and beautiful and powerful. It was a perfect tribute for sure. And Adele surely blew everyone away!! Loved the grammys this year! I also thought carrie underwood looked amazing!!! hahahah Keiffah!! TOO funny!! Adele was amazing!!! Loved Jennifer Hudson's performance. She even sounded like Whitney during some parts! I don't know what in the WORLD Nikki Minaj was thinking!! AWFUL. Nicki Minaj scares me. . .
BAHAHAH! Barbara's tweet. Freaking hilarious. I totally heard her voice when I read that. I totally have to agree with everything you said! Always love Carrie's choices; she always picks the most classic and best looking dresses! And yes,Nikki...give me a break. C'mon, can you not just sing and dance like a real performer?!?! i totally agree! carrie was stunning... and i loved katy perrys dress... but not her hair. and rhianna looked great too. barbaras tweet, is that for real?! because its hilarious. I'm cracking up over that tweet!! hahahah, i love the fact that you follow janelle's mom on twitter. teen mom 2 is one of my closet reality shows i am addicted too ;) carrie underwood was absolutely STUNING- pure perfection :) happy to have found your blog! Aside from the Teen Mom portion (that's a foreign world to me), I agree 100% with everything you said! Adele is better live than on her CD! Freaking amazing! Pure, beautiful talent!!! I follow "babs" too! I wonder if its real ya know? Love her sayings though!